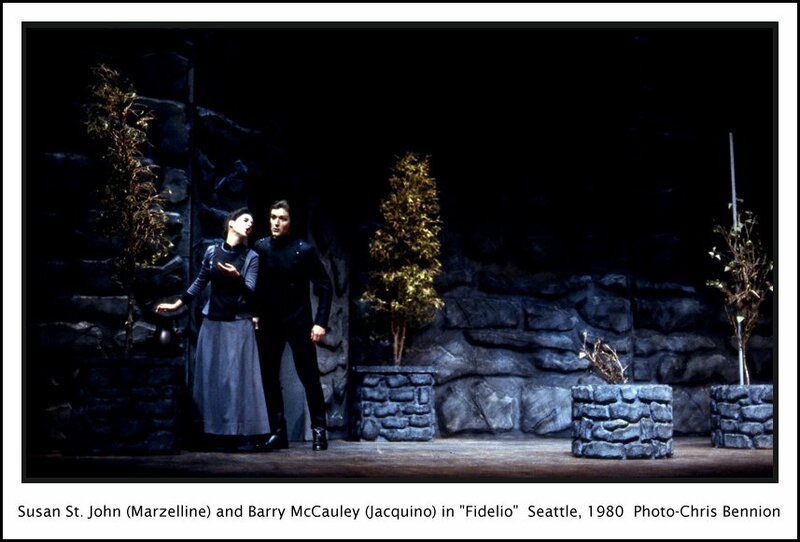 Barry McCauley Interview with Bruce Duffie . . . . . . . .
[This article originally appeared in the Massenet Newsletter in July, 1987. Barry McCauley (June 25, 1950—October 10, 2001) was born in Altoona, PA. He received his BA from Eastern Kentucky University, his MA from Arizona State University. 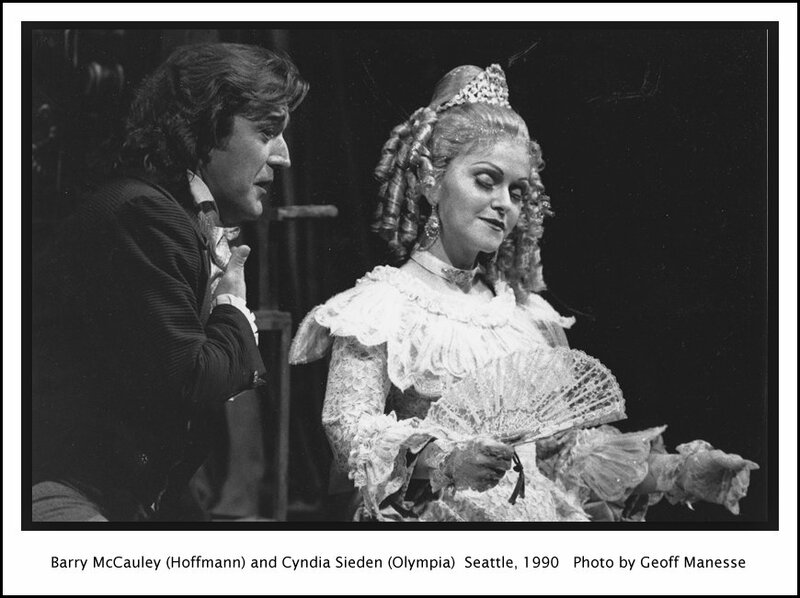 He was a member of the San Francisco Opera Merola Program for two summers, and made his professional debut as Don José with the San Francisco Spring Opera in 1977. The following year he sang the title role in Faust with the San Francisco Opera. Other roles in San Francisco included Edgardo in Lucia di Lammermoor, Ruggero in La Rondine and Pierre in Prokofiev’s War and Peace, conducted by Valery Gerghiev. His New York City Opera debut came in 1980 with the title role in Gounod’s Faust. Additional roles with the company included Rodolfo in La Bohème, Alfredo in La Traviata, Roberto Dudley in Maria Stuarda, Nadir in Les Pêcheurs de Perles, Pinkerton in Madama Butterfly, Ruggero in La Rondine and Gerald in Lakmé. 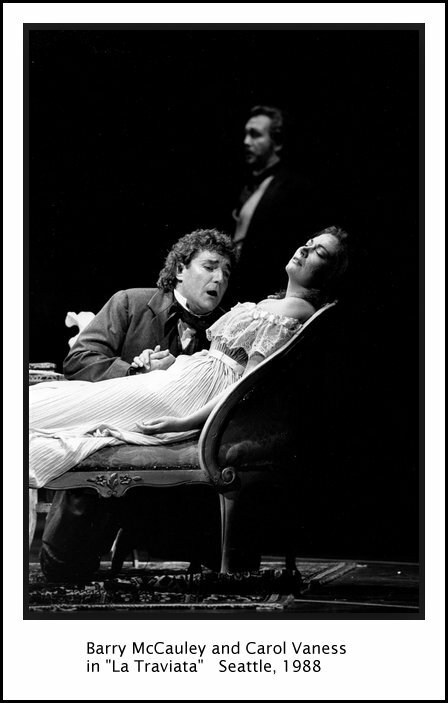 His performance of Edgardo in Lucia di Lammermoor was telecast nation-wide on “Live From Lincoln Center” during the 1981-82 season [shown in photo at right]. 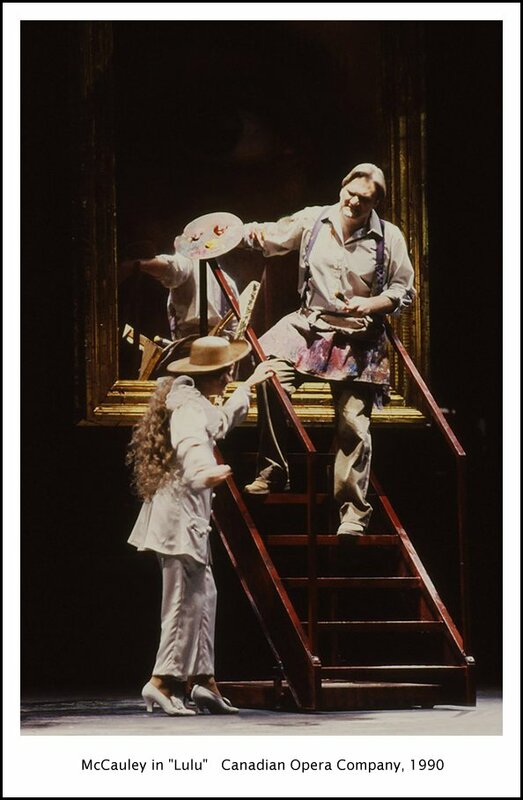 He made his Metropolitan Opera debut in 1986 as Jaquino in Fidelio. 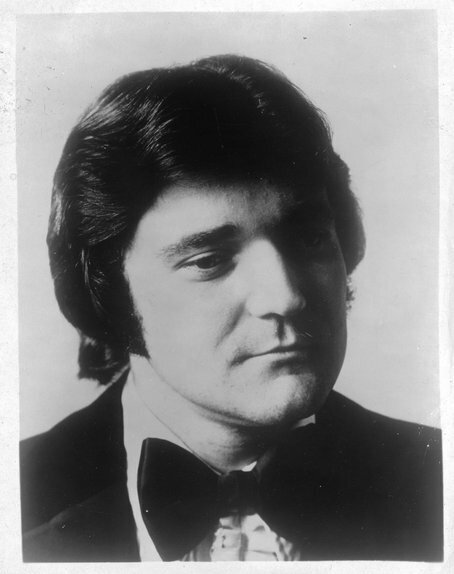 He also sang the painter in Lulu, and Cassio in Otello in a gala performance conducted by Carlos Kleiber. His Santa Fe Opera debut was as Wilhelm in Mignon opposite Frederica von Stade. His Lyric Opera of Chicago debut was as Gerald in Lakmé He returned there as Ruggerio in La Rondine with Ileana Cotrubas, and as Loge in Das Rheingold, conducted by Zubin Mehta. McCauley also had a major European career. For the Opéra de Paris he sang Boris in Katya Kabanova, Belmonte in Die Entführung aus dem Serail, Lensky in Eugene Onegin, Admete in Alceste, and des Grieux in Manon. At the Netherlands Opera he debuted in La Damnation de Faust, later returning to sing the title role in Parsifal and Hegenback in Catalani’s La Wally. Other important European appearances included Salzburg Festival performances such as Filka Morosov/Luka Kuzmic in From the House of the Dead, conducted by Claudio Abbado, and as Aegisth in Elektra (a role he repeated in concert with the Berlin Philharmonic); a portrayal of Alwa in Köln Opera’s production of Lulu; Andres and the Drum Major in Wozzeck, both at the Teatro la Fenice in Venice; Gregor in The Makropoulos Affair at the Teatro Communale in Bologna; Don Ottavio in Don Giovanni for his debut at Aix-en-Provence; Boris in Katya Kabanova and Don José in Carmen at the Glyndebourne Festival; Idamante in Idomeneo and Belfiore in La finta giardiniera in Brussels; Wilhelm Meister for the Maggio Musicale in Florence; and Hoffmann for the Grand Théâtre de Genève. He was the recipient of the prestigious Richard Tucker Award in 1980. It took me some time to finally figure it out, but there was something about Barry McCauley that was familiar. When we sat down in his apartment at a small table, I felt I had seen him before – and not just when he’d been onstage with Lyric Opera of Chicago. I brushed the feeling off and we had a fun conversation, but that nagging feeling kept up for days. Then, when watching “Late Night with David Letterman” one evening, I realized that there he was! No, not McCauley, but the reason I’d thought I’d seen him before. It was Jay Leno. That’s right, the comedian and frequent guest of that program. The facial appearance and vocal mannerisms were strikingly similar. I wonder if the comic has ever been told he reminds people of a famous American tenor who excels in the French repertoire. . . I asked him if he felt this was Des Grieux’s first affair, and McCauley said he thinks so, despite there being no comments to the fact in the text of the opera. McCauley then spoke of Wilhelm Meister, his character in Mignon as being quite different. “He’s not a cad, but he is a man of the world. So from that you’d take it that he’s seen love before.” McCauley then remarked that my question about Des Grieux being a man of the heart was a good way of putting it. He also talked about some other characters, such as Faust, which he notes is different after his youth has been restored. Gerald, he says, sits up in the high register, but needs some of the weightier kind of sound. 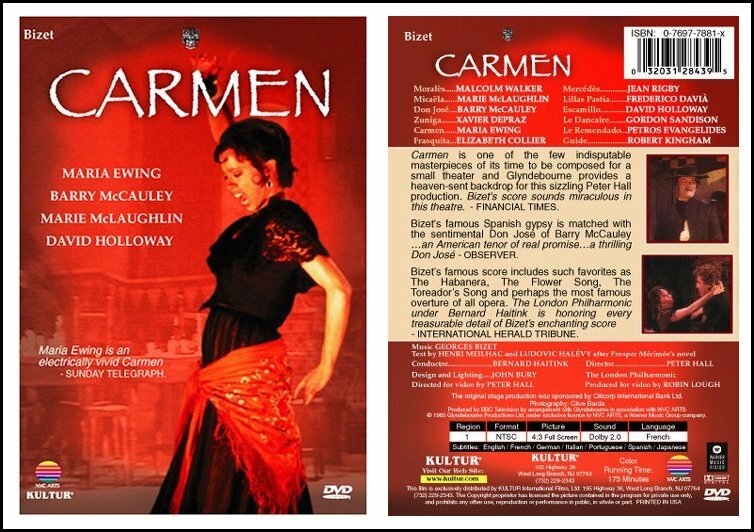 McCauley then spoke of Carmen. “In the first act, Don José must be leggiero-lyric; the second act needs lyric sound with weight to it; the third act requires that you stand on yourself to sing out, and the fourth act you just throw to the wind! So you have these different aspects within that one role.” Naturally, I asked him about going from one kind of singing to another within the same evening, and the tenor agreed that once you start putting the pressure into the voice, it’s very difficult to back up and let go. Fortunately, these roles go from lighter to heavier during the evening, and neither of us could think of a role that was written in the reverse manner. To read my Interview with Bernard Haitink, click HERE. To read my Interview with Sir Peter Hall, click HERE. This brought up the whole subject of doing opera in translation. McCauley, like all singers, has done some, but rarely sings anything but the original language any more. He recalled a Contes d’Hoffmann in Hawaii which was originally to be in French, but because the chorus was made up of volunteers, the management felt it would be better for them to do it in English. So McCauley relearned it for that production. But aren’t there always changes made by the cast when doing opera in English? “Singers always work with the translation and improve it, and also bring it more up to date. In any translation, you can always find words that have vowels closer to the original which mean about the same thing. And scores today still have ‘thee’ and ‘thou’ and other words we just don’t use any more.” I chided him a little, noting that we wouldn’t want the Devil to address Faust with something like, “Hey you, jerk! C’mere!” The tenor acknowledged the point. When thinking about texts and the intricacies of language, there come the problems involved with spoken dialogue in operas. The tenor told me about a production of Mignon in Italy with an all-Italian cast, but sung in French. When McCauley was contacted about it, he was told that they’d use the ‘comique’ version, but the conductor’s score didn’t have any of the dialogue. So the conductor made many cuts in the spoken passages which meant that going from scene to scene was very disjunct. And to add to the problems, the stage in Florence is very large, so going from scene to scene often meant moving from one side of this huge space to the other. Then, to top it all off, a man came up to McCauley saying how much he was looking forward to the big aria. The last person he’d heard do it was Gigli. But the cast found out later that many in the audience were disappointed because it was going sung in French and they couldn’t understand all the words. They were used to hearing it in Italian. Coming back to purely vocal considerations, McCauley seems not to mind the label ‘French Tenor’. He says there aren’t that many around, but his is not a specifically ‘French’ style voice. “That type doesn’t exist any longer, and there’s no one around to teach it. The closest who still exists is Alfredo Kraus. He can go up into the high register and do what is called a ‘voix-mixe’, which is a mixture of voices. It’s not falsetto or head voice, but a certain technique that was taught in earlier days. Gedda could do it. At the time I should have learned it, I was out in the business world and didn’t have the time to work with my teacher.” McCauley then added that if he could find someone to teach it, and if time could be found in his own busy schedule, he’s be glad to work on the technique. But time is important to this family man, and as he pointed out, “Once the ball starts rolling, you go from one job to another with maybe two weeks in between, and during that time you want to do nothing, or you’re coaching roles that are coming up. It’s a shame, but it’s what happens.” Developing that special technique must be done over years. This conversation was recorded at his hotel in Chicago on January 5, 1986. The transcription was made and published in the Massenet Newsletter in July, 1987. It was slightly re-edited, the photos, bio, and links were added, and it was posted on this website in 2016.